Q&A: Why Should I Learn About Fire Extinguishers? APSF Celebrates its 25th Anniversary at the ASA Annual Meeting in San Diego, CA. Why Should I Learn About Fire Extinguishers? Practice Advisory for the Prevention and Management of Operating Room Fires,1 is usually limited to the first 2 categories as management of the latter usually varies per state or municipality, and is best left to the direction of local fire codes and National Fire Protection Agency (NFPA) codes. Fires not specifically on the patient are handled differently depending upon the presence of sprinkler or suppression systems and approaches to suppression are usually comprehensive taking into account all situations even those occurring outside of patient care. A Fires involving ordinary materials like burning paper, lumber, cardboard, plastics, etc. B Fires involving flammable or combustible liquids such as gasoline, kerosene, and organic solvents. C Fires involving energized electrical equipment such as appliances, electrical equipment, panel boxes, and power tools. D Fires involving combustible metals such as magnesium, titanium, potassium, and sodium. K Fires that occur in the kitchen. In cases of airway fires, what are some important considerations? For airway fires the oxidizer (oxygen and nitrous oxide) concentration is usually the sole causative factor. Most endotracheal tubes are difficult to ignite and not likely to continue burning without oxidizers. This has been shown in numerous bench trials and illustrative videos. PVC tubes melt and undergo a de-polymerization, which results in a taffy-like consistency but does not readily sustain the burning process.3 Silicone tubes disintegrate into an ash powder.4 Removal of the tube and discontinuing oxidizer flows should be carried out as soon as possible and not focused upon the order or sequence of these tasks. Fires not extinguished by the removal of the oxidizers can usually be smothered or doused with water. More persistent fires can be extinguished with nearly any type of fire extinguisher due to the relatively small size of the fire. Carbon dioxide (CO2) extinguishers are very effective for these types of fires. What are the types of fire extinguishers that are available and what are the key differences? A: Plain Water which delivers a stream of water to cool the fire. 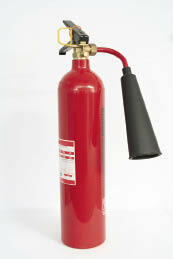 Fires extinguished with this type of extinguisher are prone to re-ignition. AC: Water Mist which delivers a fine mist to cool the fire, safe for electrical fire because the fine dispersal of mist does not allow an arc to be formed which could result in electrocution. BC: Dry chemical (sodium or potassium bicarbonate) or CO2 which smother fires. Fires extinguished with dry chemical extinguishers seldom experience re-ignition due to “blanket effect” of dry chemical residue. Fires extinguished with CO2 are very prone to re-ignition. ABC: Dry chemical (ammonium phosphate). Halon and Halotron: Extinguishes fires by displacement of oxygen and cooling and is very portable. Safest to use with sensitive electronic devices and is designated as a “clean agent.” Fires extinguished with this type of extinguisher are prone to re-ignition. FE-36 (HFC-236fa): “Clean Agent,” non-toxic, no residue, and ozone safe.5 More expensive than other agents. Other special use (D and K): Other extinguishers that are usually highly specific and are only kept in locations where appropriate. Examples are kitchen and combustible metal extinguishers. Are there health concerns with certain types of extinguishers? CO2: May result in frostbite or similar hypothermic injury if used at extremely close distances or in direct contact with skin for an extended period of time. What are the reasons why the ASA, ECRI, and other organizations recommend CO2 extinguishers over other types? For fires on the patient in the OR, an extinguisher should be safe during external and internal exposure for the patient. CO2 readily dissipates, is not toxic, and is not likely to result in thermal injury when used in an actual fire. This is due to 2 reasons, which are not readily apparent until you actually use a CO2 extinguisher in a fire. The first is the delivery of CO2 is self-limited because the lever and the handle become so cold, the user can actually experience frostbite. The other is the heat of the fire, which keeps you far enough away from the fire source so that thermal injury is unlikely. Since the patient’s tissues would be hot (130 degrees) for a burn injury, a cold injury from application of CO2 would also be unlikely. Du Pont’s FE-36 is another safe agent but is expensive and was not readily available at the authorship of the ASA advisory. One may consider CO2 and FE-36 as equally effective and acceptable agents as reflected by manufacturer’s product information. “A” rated extinguishers are water and not really safe for use in the OR considering the large amounts of electrical equipment. A water mist AC rated extinguisher is excellent, but it takes a while to extinguish a fire, and since you need adequate volume for multiple attempts to put out the fire and to evacuate, these are large and difficult to manage. However, they can be cheaply made in a non-ferromagnetic extinguisher, which is the best choice for MRI. Halon types, although very effective, are being phased out due to ozone issues and the resulting hypoxic atmosphere for the rescuers. Halotrons are “greener” Halon type extinguishers, which simply diminish the ozone depletion. Is there a strategy in the selection and placement of fire extinguishers for the OR and surgical suite? First, with respect to selection, the best fire extinguisher is easy to use, readily available, economic in use, and optimal for the specific location. Other factors to consider include are the presence of sensitive or expensive electronic equipment or computer systems, the presence of a magnetic fields such as in a MRI, and operating rooms where dry chemicals could compromise a sterile field or open surgical site. As for placement, mounting height and locations should be consistent with NFPA guidelines and local fire codes. The NFPA recommends an extinguisher within 75 ft. of any working location.8 One should attempt to be consistent with the type of extinguishers in a given location (i.e., only CO2 extinguishers in the OR) and mount in a consistent location (i.e., near the main door and on the left). What has worked well at our institution is a CO2 in every OR and with the laser cart, an A rated extinguisher in the hall cabinets, an AC rated water mist for the MRI suite, and a Halon and CO2 in the fire hose cabinets. Caplan RA, et al. Practice advisory for the prevention and management of operating room fires. American Society of Anesthesiologists Task Force on Operating Room Fires. Anesthesiology. 2008;108:786-801. National Fire Protection Association. NFPA 10, Standard for portable fire extinguishers. 2010. Chapter 5.2. American National Standards Institute. American national standard for safe use of lasers in health care facilities. ANSI Z136.3 – 2005 C.9.35. Appendix: 52. 2005. Ossoff RH, Duncavage JA, Eisenman TS, Karlan MS. Comparison of tracheal damage from laser-ignited endotracheal tube fires. Ann Otol Rhinol Laryngol 1983;92:333-336. DuPont. DuPont fire extinguishants: DuPont FE-36 use as a fire suppressant in surgical operating rooms. White Paper. Jan 2005. Available at: http://www2.dupont.com/FE/en_US/products/fe36.html. Accessed January 6, 2011. Amerex Corporation. ABC dry chemical fire extinguishant. Trussville, AL, June 2010. Available at: http://www.amerex-fire.com/msds/msd/2. Accessed January 6, 2011. H3R Aviation. Halon 1211. Larkspur, CA, August 18, 2009. Available at: http://www.h3rcleanagents.com/downloads/Halon-1211-Clean-Agents-MSDS.pdf. Accessed January 6, 2011. National Fire Protection Association. NFPA 10, Standard for portable fire extinguishers. 2010. Table 6.2.1.1.